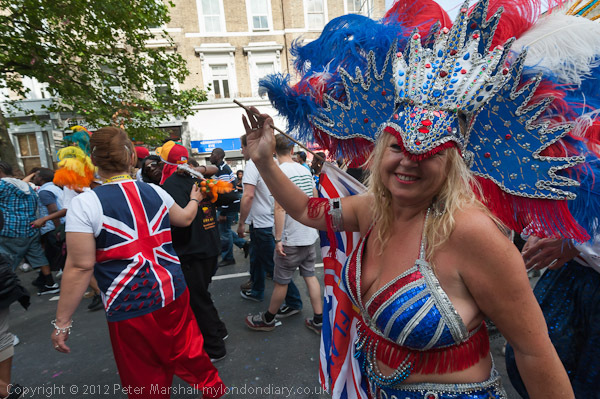 I’m not quite sure how many times I’ve photographed the Notting Hill Carnival. I didn’t go for many years perhaps because back in the 70s and 80s it had something of a bad reputation. But around the end of that decade I told myself that I was missing out on one of the major festivals in London, and it was time to go there and to take pictures. Then I travelled light and rather in disguise, packing a couple of Leica bodies (well, one was a Minolta CLE, one of my favourite cameras of all) along with a spare lens or two, a water bottle and film into an old khaki army surplus webbing haversack (you can still get them for around a fiver.) It was the film that took up most room, with perhaps a dozen cassettes of Ilford XP1 and half a dozen of colour neg. To save space I took them out of their plastic pots and packed them in bulk in plastic bags. I did find myself in a lot of densely packed crowds, where I hung the bag around my neck in front of me to keep it safe. Back then I made sure not to take anything with me that I would really miss – no wallet, no credit card etc, just a few pounds in cash. There was a lot of pushing and shoving at some points, and some people did lose bags. One year I was in a crowd were we were all pressed together close to one of the sound systems, when I suddenly realised that there was a hand in my trouser pocket and it wasn’t mine. I grabbed the guy by the wrist and slowly pulled it out of my pocket to find it clutching a wallet – but it wasn’t mine, and it was empty. In the middle of a crowd where many around me were possibly mates of his I decided it wasn’t a good time to make too much of a fuss. 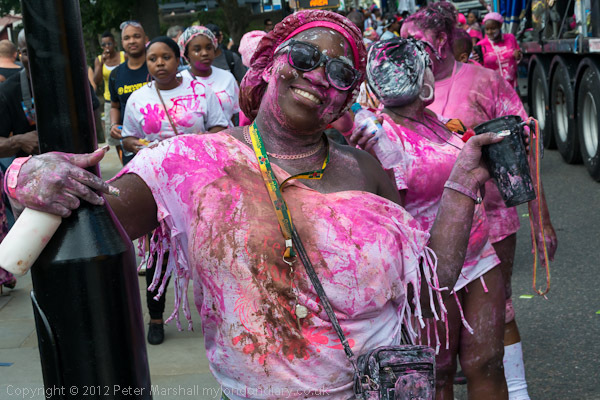 Now, more than 20 years on, most of the time carnival seems rather less dangerous, although things sometimes get a little ragged later on – but I’ve always gone home by them. This year I only went on the Sunday – Childrens’ Day – which is less crowded. And I went with my normal photographic bag and didn’t feel at all unsafe. Except from being smeared with chocolate or other materials that people on the carnival throw at each other. I did have to spend ten minutes when I got home using a damp cloth on my trousers. But somehow, carnival doesn’t quite see the same to me. Perhaps I’m getting older, but after a couple of hours I really felt I’d had enough. Probably I should have had a Red Stripe and taken a rest. It really is a great event, and this year the weather was fine, and not too hot, but I think I get tired rather faster than I used to. I was using both the D700 with the 16-35mm and the D800 with the 18-105mm. But perhaps I should have gone with a lighter bag and cameras more like the Leicas that I first went with – but I’ve still not really become fond of either the Leica M8 or the Fuji X100. Perhaps I should try using the M8 simply as a black and white camera – which it does pretty well. The X100 can work well, though too often I find myself trying to work out why it isn’t doing what I want it to do, even though I’ve updated the firmware which has improved it a lot. Somehow nothing is quite intuitive with it. 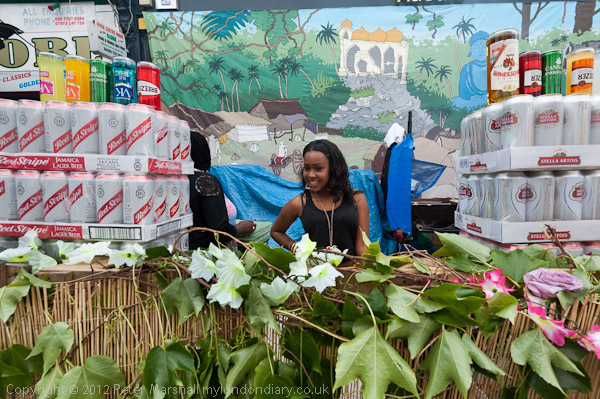 You can see more of my pictures from the afternoon in Notting Hill – Children’s Day on My London Diary. This entry was posted on Thursday, September 20th, 2012 at 07:48 pm and is filed under My Own Work. You can follow any responses to this entry through the RSS 2.0 feed. You can leave a response, or trackback from your own site.